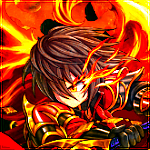 So since I have gotten back into playing Brave Frontier I am REALLY wanting a new Sig/Avi of one of my favorite characters design, story, and of course combat wise! Ladies and gentlemen I give you....Phoenix God Arus! I would like this image to be used for both the Sig and Avi if possible with the words "Bariuran Phoenix" (Bariura is the region Arus is from for those of you who don't know). Really don't have any specific wants for this combo other than the colors used. Definitely want some red/orange/yellow thrown into it to go with Arus' color scheme...a little black might look good so just use your judgement! Don't really know what to offer compensation wise outside of my undying love but I could probably figure something out...Name Change Cards, Extra PM Space, stuff like that.